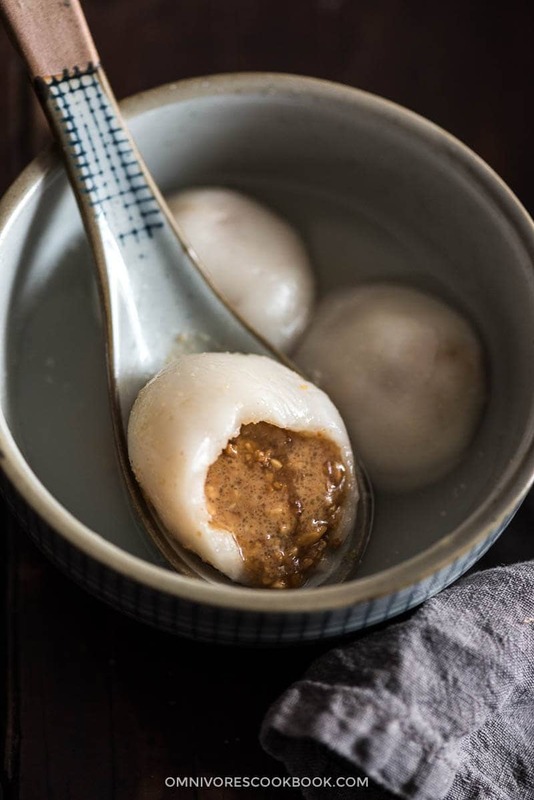 Learn how to make the best Tang Yuan with a runny filling that will melt in your mouth. Tang Yuan is one of those traditional desserts that we do actually cook at home. 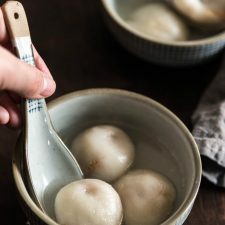 Unlike most of the Chinese pastries that involve complicated prep time and require an oven, a device that most home cooks do not own, the sweet rice balls are quite practical to make. Tang Yuan, or sweet rice balls, or sweet rice dumplings, is an important festival food that represents family reunions and happiness. It is usually served during the Lantern Festival (元宵节), celebrated on the 15th day after Chinese New Year (lunar calendar). It is a very small dumpling that is made with a sweet, sometimes savory, filling and sticky rice, that is then boiled and served in hot soup. When I was a kid, I used to make these sweet rice balls with my mom and grandma. We usually used pre-made filling from a grocery store. The fillings come in small packages, such as sweet red bean paste, black sesame paste, five nuts, chocolate, and peanut butter fillings. Traditional Tang Yuan filling usually contains lard, which is solid in room temperature especially in winter. The filling has a tough yet pliable texture, just like a dough ball. But, once cooked in boiling water, the lard and sugar melt and the filling becomes runny. It is almost like a chocolate lava cake – the hot sweet silky filling will run out once you bite into the rice dumpling. The experience is quite magical. These sweet rice dumplings were my favorite dessert growing up. To make the filling from scratch is not difficult. But to make a great tasting Tang Yuan, you really want to pursue that runny filling. It means you need to solidify the filling before wrapping the dumplings and work on them quickly, so they won’t become too tender or melt. 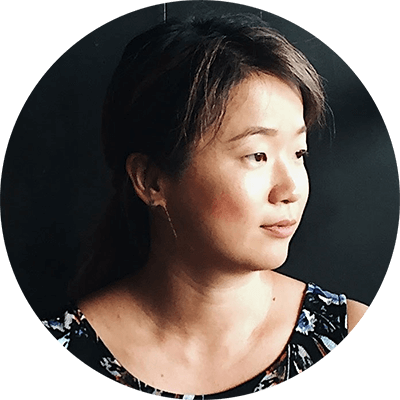 The task might look a bit challenging, but it can be done if you maintain a good workflow (described in the recipe below). Today I want to introduce one of my favorite fillings – peanut butter filling made with toasted peanuts and original peanut butter. 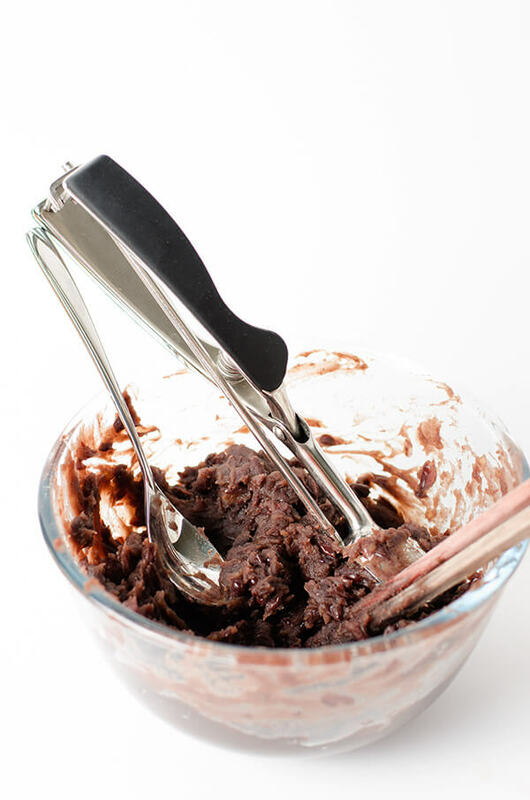 As an alternative, you could also use homemade red bean paste in this recipe. 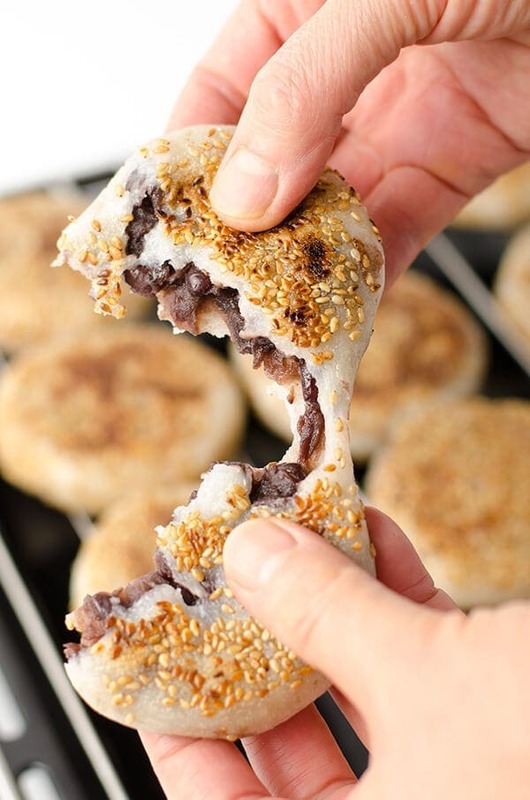 The red bean paste filling will be easier to work with and you do not require chilling before wrapping, but you won’t get the runny texture like the filling this recipe. 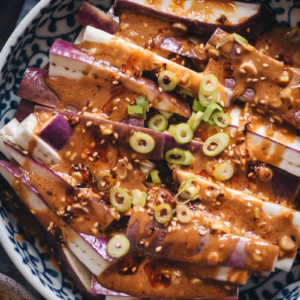 A quick tip: you can also use the peanut butter filling to make these crispy sticky rice cakes! Spread peanuts in a pan and heat over medium heat on stove. When the pan turns warm, turn to medium low heat. Shake the pan occasionally for even cooking. Toast until the peanuts turn golden but not darkly browned. Alternatively, you can roast the peanuts in 350 F oven for 8 to 15 minutes, or until the surface turns golden. Shake the pan occasionally during baking. Ground the peanuts in batches by using a coffee grinder, in a mini food processor, or by using a mortar and pestle until finely grounded, but not into powder. You can leave the pieces a bit larger if you want a chewy texture. Transfer to a bowl. Add peanut butter, sugar and coconut oil. Stir to mix well. Transfer to fridge to harden for about 30 minutes or longer, until it’s possible to scoop out the filling and shape it. If you leave the filling in the fridge for a longer time, it will harden even more and might be a bit difficult to shape. If this is the case, place the filling in room temperature for 5 minutes to let it soften a bit before shaping. Use a small spoon to scoop about 1 teaspoon to 1 and 1/2 teaspoon of filling. Shape it quickly into a ball, and place on a small tray or in a container. 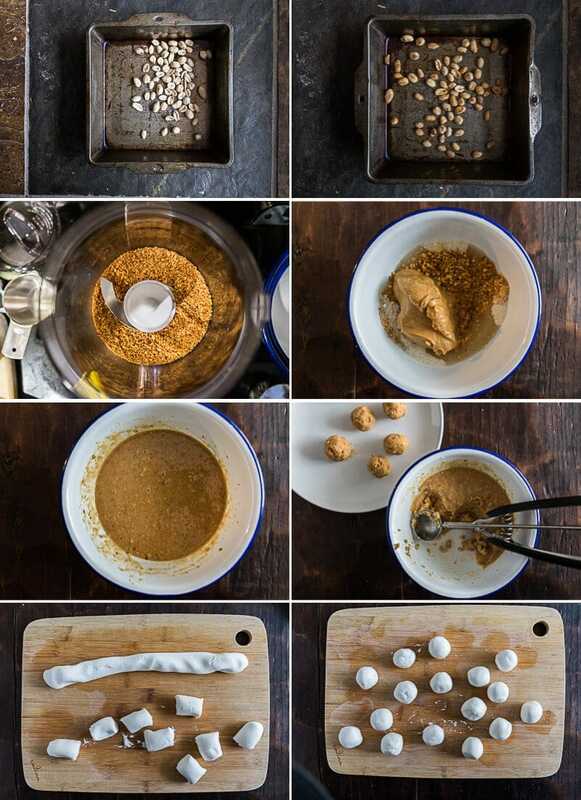 Transfer the peanut butter balls into the freezer while making the dough. Add glutinous rice flour in a big bowl. 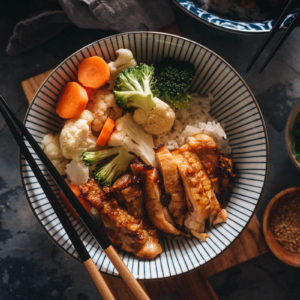 Slowly add warm water and whisk with a pair of chopsticks (or a spatula). When the water is fully absorbed, use your hands to press and work it into a dough. If the dough is too sticky, add more glutinous rice flour, 1 tablespoon at a time, and keep kneading the dough. Unlike wheat flour dough, rice flour dough does not require a lot of kneading, so it is done once the dough is shaped. Transfer the dough to a big bowl and cover with plastic wrap or a clean wet towel, to prevent it from drying out. Divide the dough into 4 equal pieces. Shape each piece into a round ball. Work on one dough ball at a time and return the three dough balls back into the large bowl, then cover with plastic wrap. Roll the dough ball into a long even strip. Cut to 8 pieces. Roll into small balls. Work on the dough balls one by one. Flatten the dough into a round disk that has a dent in the center. Place the filling in the center of the dough. Seal the filling carefully by wrapping and spreading the dough. When you cannot see the filling anymore, roll the dough into a round ball by using both hands. 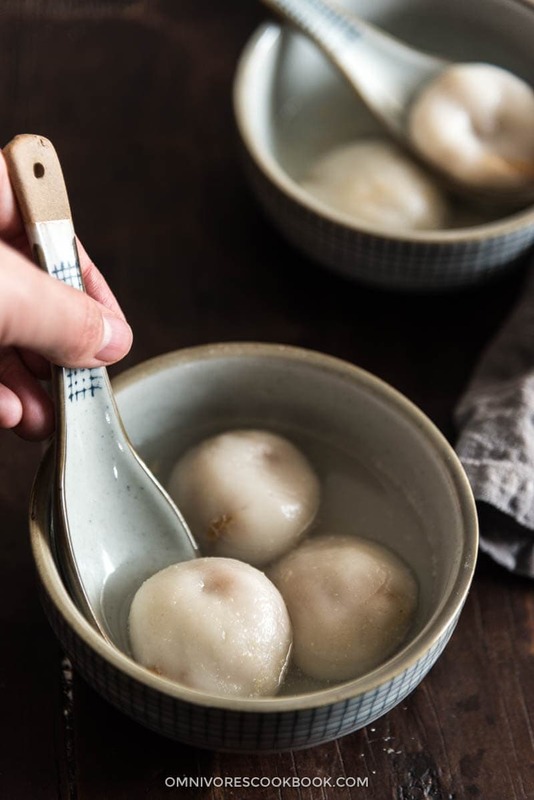 If you find the dumpling is too difficult to seal, knead the rest dough balls back together into one big dough ball again, cut into 5 pieces to 6 pieces and try again. It is very important to wrap and seal the dough tightly, so the dumplings won’t fall apart during cooking. The filling will become soft if placed in room temperature for too long and become very difficult to wrap, especially if you’re using coconut oil. I suggest you to take out a few filling balls at a time to work with, and store the rest in the freezer. Work on the rest of the dough balls using the same method. Now you can cook the rice balls or freeze them for later. Bring a pot of water to a boil. Carefully add the number of rice balls you plan to serve. Cook and stir occasionally until the rice balls float on top and the skins look translucent. Immediately transfer the rice balls to small serving bowls with just enough boiling water to cover them. We usually eat the rice balls with some boiling water. If it’s not sweet enough for you, add a few drops of honey or osmanthus syrup into the boiling water to sweeten it. Place leftover filling in a ziplock bag, squeeze out as much as air as possible, and seal. Store in the fridge for 1 week or in the freezer for up to 3 months. To store the raw tang yuan, place them on a tray, 1 finger apart, and cover with a plastic wrap. Freeze until completely frozen. Transfer to a ziplock bag or airtight container, store in the freezer for 2 to 3 months. Note, you should always cook the amount of tang yuan you plan to serve and eat them while they’re warm, soon after cooking. Always store the extra tang yuan in the raw form in freezer. If you do not follow a vegan or vegetarian diet, I recommend that you use butter or lard instead of coconut oil. The filling will be easier to handle and won’t melt too fast when you start wrapping. Glutenous rice is also called sticky rice. Note, despite its name, the rice flour is gluten-free. Peanut butter filling is the best! Happy year of the rooster, Maggie! These are definitely to die for! look at that peanut flowing out !!! i’ve been meaning to make tang yuan for a while now, but still haven’t gotten around to it! it sounds like some work, but worth it (: and i love how creamy that peanut butter filling looks! It was quite a bit work but totally worth the effort! Happy Chinese New Year Heather! Gong Xi Fa Cai Maggie! Making tang yuan is always a tricky thing. I always ended up with a couple of failed ones, especially after a long time of not making any tang yuan 🙂 But they really are such a treat, isn’t it? Beautiful tang yuan photos, Maggie. Tang yuan is a must for lantern festival! Your tang yuan filling is so runny, which I love! I certainly won’t be able to wait until the 15th! I want a bowl RIGHT NOW! NOM! Gong Xi Fa Cai! Xin nian Kaui Le Maggie! You are making us miss HK that is for sure. There is nothing better than a little tang yuan to end the perfect gathering. Sharing of course! I never heard of these before, but was impressed by their unique preparation method and simple ingredients. The rice flour dough was delightful to work with. 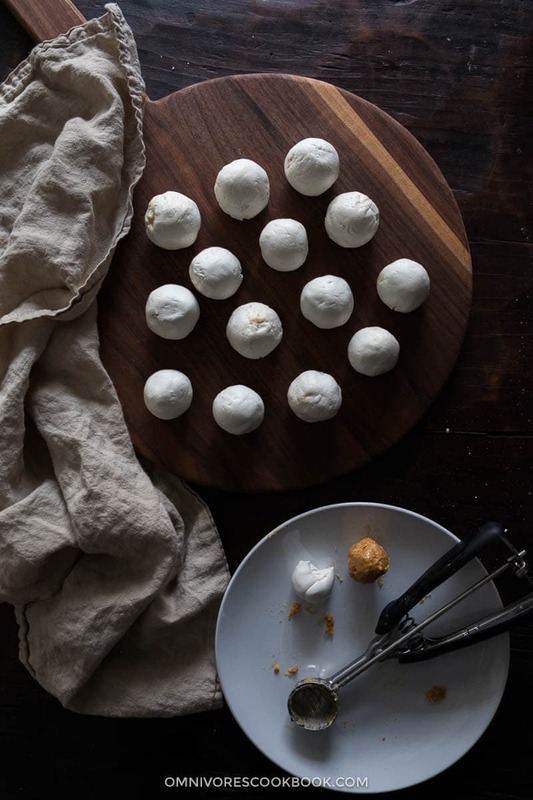 It was easy to correct the consistency of the dough and it streched perfectly around the peanut butter balls. I am excited to use this dough again when i prepare your red bean sesame cakes! The final product was delicious and i still have some left in the freezer for another day! Hi Kristen, I’m so happy to hear you tried out this recipe although it is a new dish you’ve never heard of! Yes, the rice flour dough is easier to work with than the normal wheat flour dough, so I enjoy cooking dessert with it. You’ll find out it also creates a crunchy crispy texture when you fry it with some oil. I haven’t had tang yuan in such a long time, I totally love it and miss it due to my kids’ food allergies. However, I think there are other fillings to use. 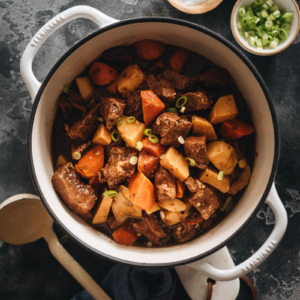 Thanks for the recipe, happy #sweetlunarnewyear! Would dates work in the filling? I am reluctant to use so much sugar. Or is it something special with sugar that can’t be substituted?